The benefits of divorce mediation | Divorce, with or without mediation, can be a messy affair, with tempers flaring and strong emotions coming into play every time you meet with your spouse to discuss the terms. In far too many cases, one or both spouses begin to hate the other and want to do anything to hurt them – including gaining as many of the assets as possible in the settlement. When raw emotions are involved, it’s hard to see clearly and make or understand a well-reasoned argument. It’s also difficult to comprehend the long-term repercussions of a drawn-out and vicious battle with your soon-to-be ex-spouse. The longer the fight goes on, the more people you’ll affect – your children, your family and your friends. This is why sometimes it’s best to get an outsider to come in and mediate the divorce proceedings. With a neutral person in the room – a lawyer who has been hired by both parties and is working for both of your best interests – you’re likely to reach an agreement much quicker. You’ll have a calming presence when tempers flare – A mediator isn’t emotionally invested in the proceedings and can, therefore, keep calm and listen to both sides of the argument. This person will also be able to see the logic behind the arguments and advise both parties appropriately. Your personal lawyer doesn’t always have enough information to provide you with the right advice as they’re mostly hearing only your side of the story. They’ve also been hired to fight for your best interests, and you wouldn’t want them to concede that your spouse has a better claim. You’ll likely come to a settlement much quicker – Court battles can go on for months in some divorce cases. During this time, you could lose a lot personally – never mind what you will spend on legal costs. Think about how a protracted fight could affect the rest of your family and your friends, and especially whether or not they may have to take sides at some point. Simon Dippenaar & Associates Inc. are experts divorce and family law attorneys in Cape Town. 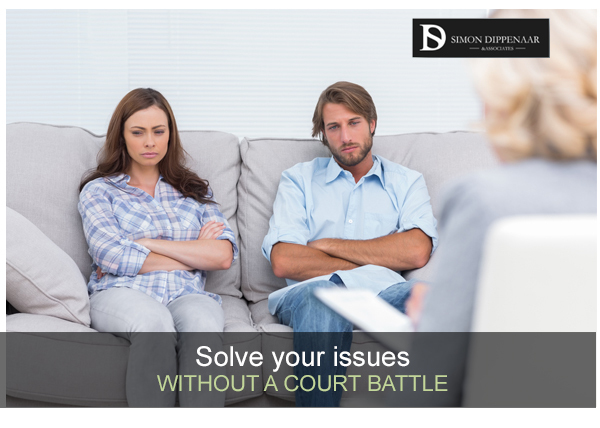 Contact Simon on 086 099 5146 or email sdippenaar@sdlaw.co.za today to ask about getting a mediator for your divorce case. It could be the turning point to an amicable solution for both you and your ex-spouse. For how to choose the right divorce attorney click here. To learn the difference between divorce and annulment click here. For more about a divorcing a foreigner in South Africa click here. This entry was posted in Divorce mediation and tagged divorce attorneys, divorce lawyers, divorce mediation, mediator. Bookmark the permalink. ← Divorce and Annulment – What’s the difference?